There is more to sight than just physical seeing. The human sight creates its own obstacles; it stops seeing where the general consensus says it should. There is much more to this dimension than meets the eye. We are often, if not always being watched by beings that we ourselves can’t see with our naked eye. When we do see these Beings, it is often only after they have given us permission to see them, and perhaps after they have made some adjustments in themselves so we can receive them easier. Something ancient comes into our world. At first it’s invisible but slowly as we open, this new energy becomes woven into our daily lives. It’s something from within, yet outside too, something beyond our understanding, still there is a hint of familiar. A new perception seeps into our thoughts as it stretches the boundaries of our perceived “normal” reality. We are more than we know! The sciences of quantum physics speak to the future is the past, and the past is the future, and both join together in the now. Our true ancestors are guiding us from the future and from the past and on another level we are those ancestors. The Apache dancers, Cosmic Connections are time travelers; our soul is a time traveler. In this auspicious time we are living it is time for the time travelers to wake up. There is a soul urge within us to access higher knowledge. As we open to the secrets of time and space we will find higher frequencies available. We may see new things appear in the Sky above that will re-mind us of our Connection to the Star Nation, our Guardians. In the quantum world, all things exist simultaneously and all things are possible. Timelines are not necessarily linear but side-by-side and simultaneous. It is possible and highly probable as all thoughts go into the great quantum field, which is called the mind of God, or the Akashic records we can potentially access these and gain knowledge of the actual mysteries in the stars just waiting to be found. There seems to be something secret about everything and everybody, a mystery to behold in letting go of our perceptions and understanding our conditioned mind is not the truth. What we see in everyday life is not the natural world deceiving us, but nature encoding reality in ways we can accept or come to terms with. Perhaps the natural world looks the way it looks because of the way we are conditioned. Ancient Symbols speak it seems we Can Awaken from the dream. 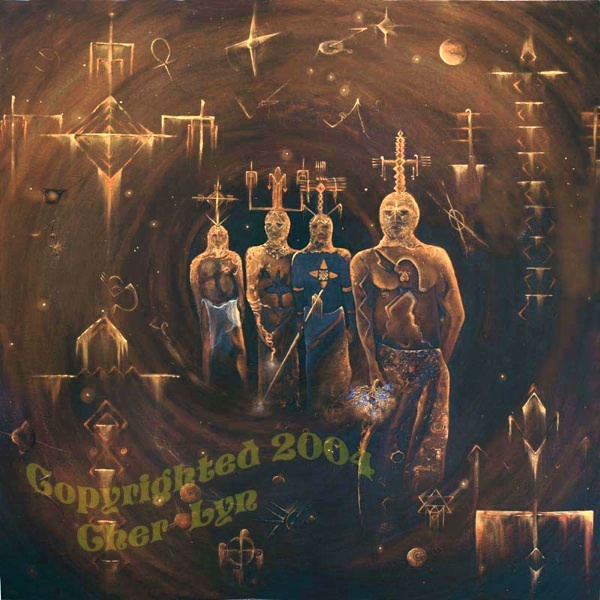 The Story: Originally I began “Cosmic Connections” in 1995; my intention was to paint the “Apache Dancers” as the painting once was titled. I took their image from one of Edward Curtis’ photo, but when I depicted them onto the canvas they way they were in the photograph; they looked beaten down and it reminded me of the Trail of Tears and the sadness of the annihilation that took place back then. I knew it was because they danced all night and were tired but this was not what I wanted to illustrate in the painting. I re-painted them standing strong and tall, proud and united, they are emerging out of a black hole vortex. When I moved to Sedona, Arizona in the end of 2001 I felt a need to go in and fix what appeared to me to be scratches on the painting. As I sat again with the painting the more I gazed and meditated with it, I realized I was seeing symbols coming out of the vortex and from the dancers bodies. The more I painted in the symbols, the more I saw. The dancers glowed with symbols and as I brought the symbols through I discovered I recognized them as our Star Nation family. The Beings in the painting of “Cosmic Connections,” are Apache dancers. Glowing symbols are floating and spinning emerging out of the vortex and off the dancers bodies themselves. They are our star brothers watching over us, helping us remember why we are here. The blue flowers are from a dreamtime journey into another dimension on another planet, the star brother holds them as a gift, he brings from home. The other brothers hold curative tools of power from other worlds, gifts to channel and minister to support.